This entry was posted in Riverfront News on March 19, 2014 by NRR. 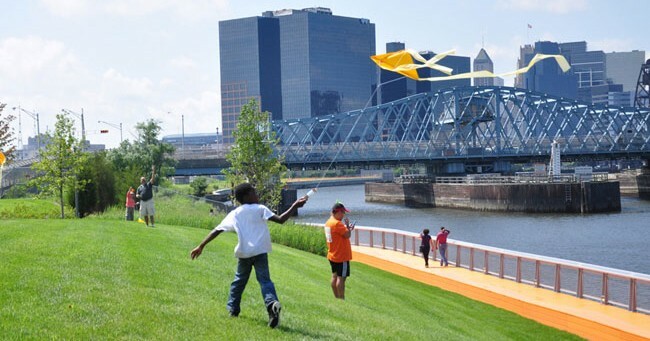 Last year, Newark continued its proud return to the river with the opening of the Orange Boardwalk as part of Riverfront Park Segment 2. Working since 2008 with many committed partners, Newark Riverfront Revival works to bring every Newarker to visit their river. We organize free and low-cost activities like concerts, tours, environmental workshops, movies, public art, public exercise and sports to draw Newarkers and visitors from across the City. With the support of major new funders like the National Endowment for the Arts, it appears that 2014 could be Newark’s most memorable summer on the river! You are invited to a 2014 Newark Riverfront Sneak Preview on Thursday, March 20, 2014 at 6 pm. In the historic atrium of City Hall, hear from Newark Riverfront Revival staff and partners about what’s in store down by the river. This summer, we want every Newarker to visit their river. We need your help to accomplish our goal: how do we get every Newarker down to the water? How do we get the word out? How can we make it an easy choice for people living and working in the five wards and nearby? This entry was posted in Public Programs on March 10, 2014 by riverfrontcoordinator.